In this recipe medium sized cauliflower floaters are cooked in onion tomato based gravy and then cooked with basmati rice. 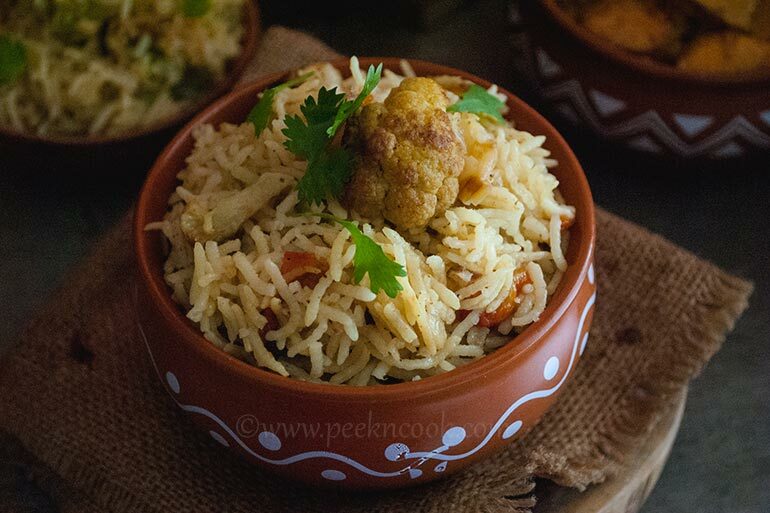 You can easily skip basmati rice with Gobindo bhog. Take a large pan heat oil, fry the cauliflower floaters till they turned into nice golden brown in color. Take them out of the pan and keep aside. In the same pan add ghee, bay leaf, cinnamon stick, cloves, cardamom pods and lightly fry till nice fragrance comes, add sliced onion, little salt and keep frying till the onion looks light golden in color. In the meantime take a bowl, add ginger garlic paste, turmeric and biryani masala, little water and make a paste. Add the paste to the pan and keep stirring. Add the fried cauliflower and mix with the spices nicely. Now strain the basmati rice and add it to the pan and keep mixing with the cauliflower mixture for 1 minute. Add 4 cups warm water to the pan, check for salt, add some if required, and cover the pan for 10 minutes. After 10 minutes your Cauliflower rice will be ready. Serve hot with raita and any veg or non veg curry.